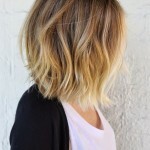 Curls are ‘bustin’ out all over’ for spring/fall and here’s a shaggy, curly haircut to tempt you to join in! If your hair is naturally curly, make the most of it with a layered shaggy bob and forget hot-iron straightening sessions. Volume is back and big hair is centre-stage for 2015-2016, so if your hair is limp and straight get a perm and see how much thicker your hair looks with tousled spiral curls! This is a casual look that projects a feminine, carefree image and at this length, it’s also easy to pin up for a special date! The haircut needs to be kept fairly long for this medium hairstyle as curls make hair look a lot shorter. Add in a touch of asymmetry and a side-swept peek-a-boo fringe and see how flirty you’ll feel! Some of us are very happy at the return to ‘high-volume’ glamour, as those smoothed-down, flat-to-the-head straight styles did tend to emphasise any extra pounds we may have been carrying!